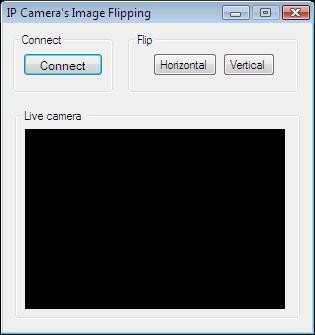 In this guide you will find detailed information on how to flip the image of your IP camera device. To implement this example, you need to have OZEKI Camera SDK installed, and a reference to OzekiSDK.dll should be added to your Visual Studio project. How to flip the captured image of an IP camera device on X, Y or on both axes using C#? Flip(): this is the only additional method of this example. The method belongs to the "Horizontal" and "Vertical" checkboxes that can be seen as buttons on the graphical user interface. The application checks these components until it gets closed. Whenever one of the checkboxes changes, it is going to cause an event that we can listen to. The method adjusts the image orientation of the camera according to these checkboxes. Flip(): this is the only additional method of this example. The method belongs to the "Horizontal" and "Vertical" checkboxes that can be seen on the graphical user interface. The application checks these components until it gets closed. Whenever one of the checkboxes changes it is going to cause an event that we can listen to. The method adjusts the image orientation of the camera according to these checkboxes.